I’m on the hunt for the perfect recipe for white/vanilla and chocolate cake. I’ve feel like I’ve found the best recipe for Red Velvet (thank you Martha Stewart), but now I’m looking for a moist, rich cake, more dense than sponge, but not quite brownie-style. On that note, (or maybe with that excuse), I’ve bought another cookbook, but this one by a James Beard recognized chef. 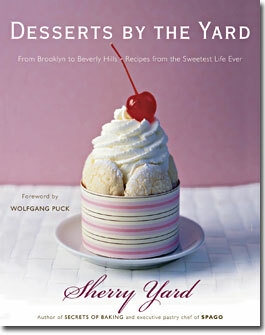 As the pastry chef for Wolfgang Puck, Sherry Yard is behind some of the magnificent desserts that have been served at the Oscars. Now I’m hoping to try to duplicate some of her success, in cake form. I’ll keep you posted on the results.